STOP PRESS: Jan from Marietta takes us here in her short movie on the Introduction page. Mary was buried in what is now the Marietta City Cemetery on Tuesday April 29, 1913. Eye witnesses said that her mother was overcome with grief several times during the ceremonies. After the funeral, the Knights of Mary Phagan gathered around the grave and swore to revenge her murder. Her grave is in the South-East corner where Cemetery St. and W. Atlanta St. intersect. Near the top of the rise, look for the black information marker on a pole. 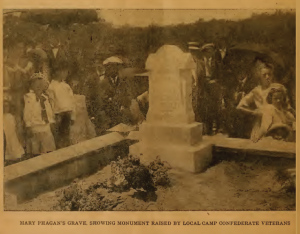 IN THIS DAY OF FADING IDEALS AND DISAPPEARING LAND MARKS, LITTLE MARY PHAGAN’S HEROISM IS AN HEIRLOOM, THAN WHICH THERE IS NOTHING MORE PRECIOUS AMONG THE OLD RED HILLS OF GEORGIA. SLEEP, LITTLE GIRL; SLEEP IN YOUR HUMBLE GRAVE BUT IF THE ANGELS ARE GOOD TO YOU IN THE REALMS BEYOND THE TROUBLE[D] SUNSET AND CLOUDED STARS, THEY WILL LET YOU KNOW THAT MANY AN ACHING HEART IN GEORGIA BEATS FOR YOU, AND MANY A TEAR, FROM EYES UNUSED TO WEEP, HAS PAID YOU A TRIBUTE TOO SACRED FOR WORDS.